Anyone who has ever travelled to Mexico will know that Australia gets Mexican food wrong. So very, very wrong. Until now. An authentic Mexican experience has landed in Sydney, so do yourself a favour and make like Speedy Gonzales to new Potts Point restaurant, Chula. Located next door to the flashy new Flamingo Lounge, Chula was established by Peter Lew and Nicole Galloway, the couple behind Fei Jai and Barrio Cellar. The elegant new venue was designed by Joshua Clapp from Steel + Stitch and features warm desert tones of terracotta and agave, and woven cocoon-style lighting that casts a soft glow over cane basket chairs and sunken lounge seating. 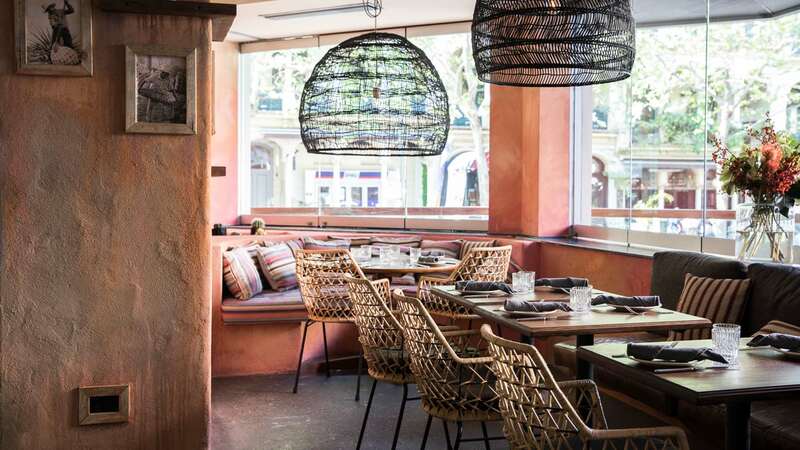 Chula's food offering was created by expat chef Alvaro Valenzuela, who moved to Sydney from Mexico City to showcase the fresher, more vibrant side of his native cuisine. Rather than nachos, burritos and quesadillas, the menu dishes up lesser-known regional specialties, such as aguachile, a lime and jalapeño-drenched seafood ceviche, and tlayuda, an Oaxacan pizza made with black bean puree and a local stringy cheese. If you're here because you want to try real Mexican fare, you can't get more real than the tlayuda topped with huitlacoche, a black blistery corn fungus. Despite the name and the images on Google (don't look!) huitlacoche is actually pretty darn delicious — it has pungent, earthy flavours and a funky kick of blue cheesiness. That said, it's probably not for everyone. For the not-quite-so adventurous, three tacos make an appearance on Chula's menu; although, they have little in common with the El Paso meal kits you may be used to. Forget the bleached wheat tortillas you find in supermarket aisles, Chula uses proper chewy corn tortillas stuffed with charcoal scotch fillet (two for $15), cactus (two for $13) or crispy fried fish (two for $15) — the last is served with an addictive chipotle sauce. In regards to dessert, all you need to know is that they do a churros ice-cream sandwich with salted caramel ice-cream and a sticky cajeta sauce, a Mexican caramel made from goat's milk ($14). The venue also has a sizeable bar, which has been elaborately decorated like a shrine to the spirits — quite literally. If you're struggling to choose between the spicy green chilli margarita and the sour, blood orange version, por que no los dos? However, be warned — the cocktails are surprisingly strong. If you're keeping things low-key, look to the michelada, a lime-spiked beer with a thick chilli and salt rim. Whether you're after a cultural exploration of Latin America or just a strong drink and a tasty meal, Chula delivers on both. Let's hope it starts a Mexican wave of new, authentic eateries in Sydney.